One of the biggest challenges for Six Sigma practitioners in financial services is developing the ability to recognize waste. What is even more astonishing is how much that distance could be shortened. Bank One’s team came up with a workspace design that required just 386 walking steps to complete the entire process – an 80 percent reduction in transportation. Most departments or companies that provide financial services are in the same position as Bank One. They accept things like traipsing up and down hallways as simply part of “how work is done around here.” But success with Six Sigma means developing new eyes, then critically and regularly re-examining what is being done and how it is being done. The goal is to identify the steps in processes that are value-added in the eyes of customers. That is, steps which customers would value and be willing to pay for if they knew about them. Everything else is waste. A company will never be able to recoup the time, resources and dollars spent on waste. Not knowing what customers want. For example, including return envelopes for loan payments is seen as value-added by customers who pay by check, but waste by customers who pay through automatic transfer. Redundancy. Consider a process that involves a number of approval steps or handoffs. Would customers think that each of those steps is adding value? Rather than requiring five managers to sign off on a decision, why not develop a process and guidelines so one manager can make the call? Unnecessary movement of materials, products or information – Too much physical back-and-forth movement is one of the problems that plagued Bank One’s original lockbox process. Excess transportation is important because every move from one activity to another adds time to a process – and world-class organizations are passionate about reducing time. Yet in many service processes, it is not uncommon for paperwork to loop back several times…waiting in queues in a virtual or actual in-box every time it goes through again. Transportation in service processes almost always manifests itself as materials constantly being collected or delivered, or the actual or virtual chasing of information (“Who has that expense figure? Marcy? Okay, I’ll ask Marcy…. Marcy says Hector has it…”). At one end of the spectrum, eliminating excess transportation can involve combining steps to eliminate loops. Cutting the hand-offs in half generally cuts the queue time in half. At the other end is the option to rearrange the workspace to match the flow of the process. Needless movement of people – While “transportation” refers to the movement of the work, “motion” involves movement of workers. Both are much harder to see in service environments than in manufacturing. Motion may show up as people constantly switching between different computer domains or drives, or simply having to perform too many keystrokes to accomplish a computerized task. Solutions can involve everything from rearranging people’s desks, to purchasing ergonomic furniture and equipment, to using software that performs tasks offline so information is waiting for the staff rather than vice versa. Any work-in-process that is in excess of what is required to produce for the customer – The evils of inventory were first recognized in manufacturing because that is where the inventory itself is most visible. It is hard to ignore a room full of half-completed assemblies – a visible reminder of thousands of dollars the company could be putting to better use. Any delay between when one process step/activity ends and the next step/activity begins – One of the biggest evils in today’s marketplace is to make customers wait for delivery of a product or service – because chances are a competitor will be able to get it to them quicker. Anything in a process that makes a work item wait to be processed should be eliminated. 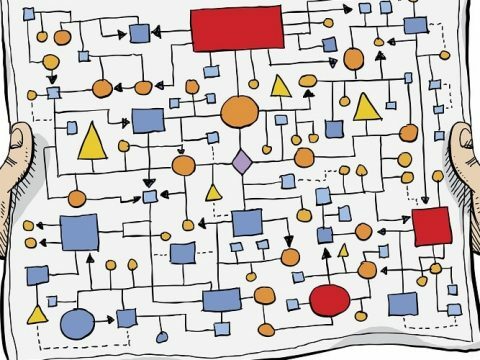 Because so much of the work in a service process is invisible to the naked eye, process-mapping techniques (flow charting, value stream mapping) are essential for identifying delays in a process. Any aspect of the service that does not conform to customer needs – Producing work that customers are not going to pay for – or that makes them seek out other companies to do business with – is one of the more obvious forms of waste. Six Sigma practices have long been structured around minimizing the possibility of producing defects. In services, that translates to preventing the possibility of missing information, thus improving the chance of making deadlines. One clue to studying defects is to recognize that their impact is usually felt far downstream from where they occurred. A customer service staff, for example, is likely to receive the complaint calls from customers upset about something that happened in an entirely different part of the process. The defect has to be traced back to where it happened – where the incorrect information was put into the computer system, for example – in order to find a solution that will last. The better Six Sigma practitioners in financial services are at recognizing these forms of waste, the more effective improvement efforts will be.